If you've been following my culinary adventures, you've probably noticed how much I love pistachios! Daddy (my father-in-law) went to visit one of his friends in Sacramento who grows orchards of pistachios. Daddy brought bags filled with fresh pistachios back for me to have fun with. I had never seen or tasted the raw product and it was amazing. The color is richer and greener. 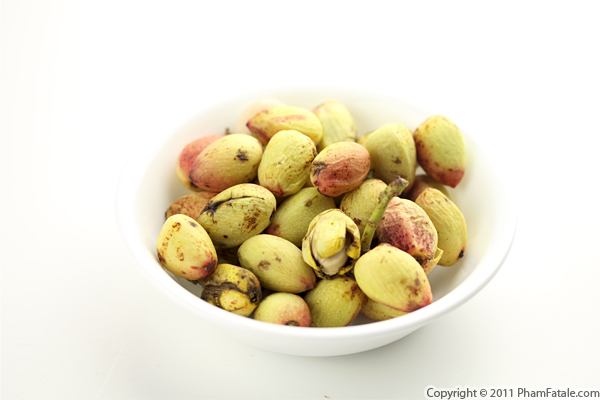 Daddy said raw pistachios are very common in India and picking the pistachios brought him back in time. There were so many pistachios that I had to come up with creative ways to make use of them. I immediately thought of making pistachio paste by grinding and blending them raw with a little Bourbon Barrel Vanilla Sugar. I also added pistachio oil to make the paste smooth and creamy because pistachios contain very little natural oil compared to other nuts. I also added a touch of almond extract to give the pistachio paste a nice aroma. I didn't stop there. 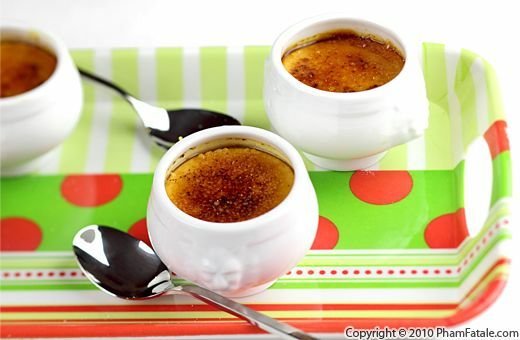 I used the paste to flavor a typical French dessert: crème brûlée. I've made crèmes brûlées so many times (lavender, banana, cherry, masala chai, matcha green tea, lemon, chocolate, vanilla, butterscotch, even a savory garlic flavored-one!) that after checking back on PhamFatale.com, I was surprised to see that I never posted this particular version! The pistachios were so fresh that it was almost guaranteed that the crèmes brûlées would be divine. To accentuate the dessert, I used vanilla sugar from Bourbon Barrel in the pistachio paste, the custard mixture and the brûlé part itself. It’s just more evidence that a few exquisite ingredients can transform the simplest foods (eggs, milk, cream and sugar) into something extraordinary. In addition to tasting incredible, this naturally green-colored dessert can be part of your Halloween table. 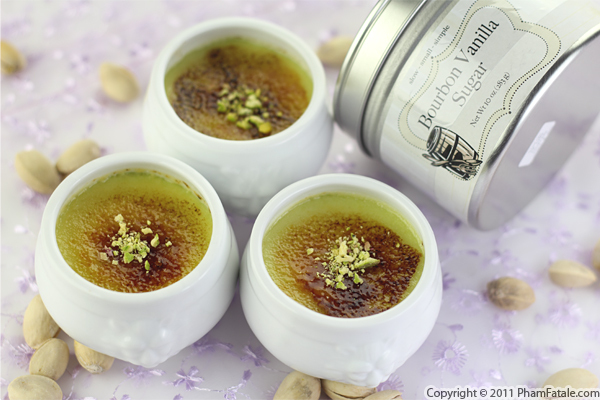 The kids can have their Snickers and Twix; I’d rather have one (or three) of these pistachio crèmes brûlées! Cinco de Mayo commemorates the Mexican army's unlikely victory over French forces in 1862. The celebrations here in the Bay Area are always fun and I wanted to get in on the festivities. I love chocolate desserts, so I made a spiced chocolate flan. 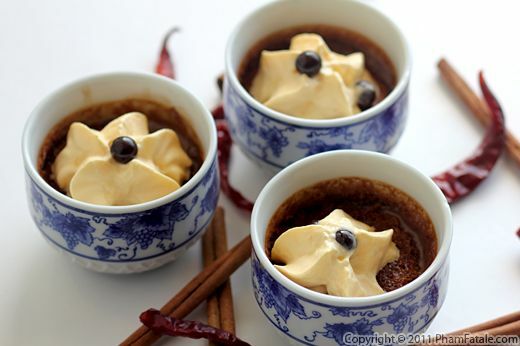 I flavored the custard with Mexican chocolate, cinnamon and a small amount of cayenne pepper for a pleasant warmth at the end. Enjoy! 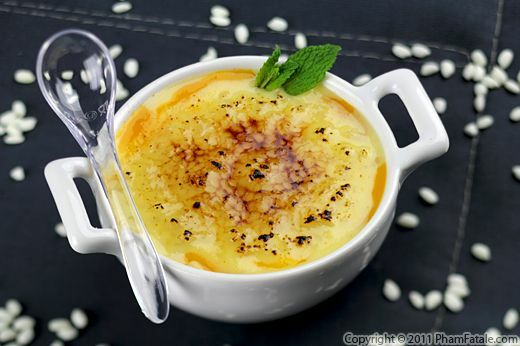 If you go through the previous crème brûlée recipes I've shared so far, this savory version will probably raise some eyebrows. It's not that I've run out of ideas for sweet crèmes brûlées; there are plenty more to come. I've just been toying with the idea of making a savory one because I think the creamy custard and crunchy top create a perfect canvas for savory ingredients. 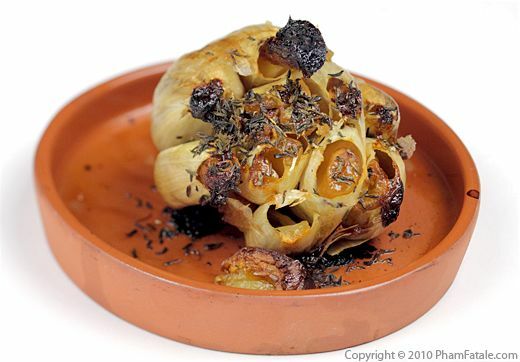 I chose roasted garlic, goat cheese and herbs because they are intensely flavorful and make an excellent camouflage for the egg flavor. For the top, I mixed parmesan cheese and a bit of sugar and then took my blow torch to the mixture. 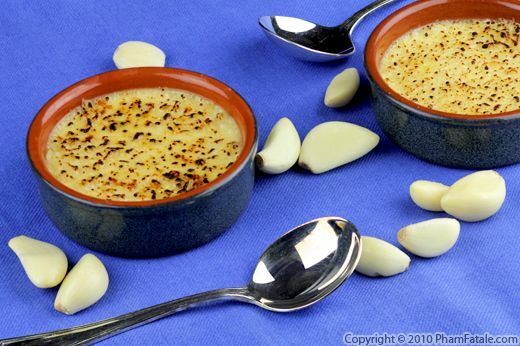 Savory crèmes brûlées can be quite an original appetizer to serve at your Christmas party. They are uncommon enough to help mark just about any special occasion though.